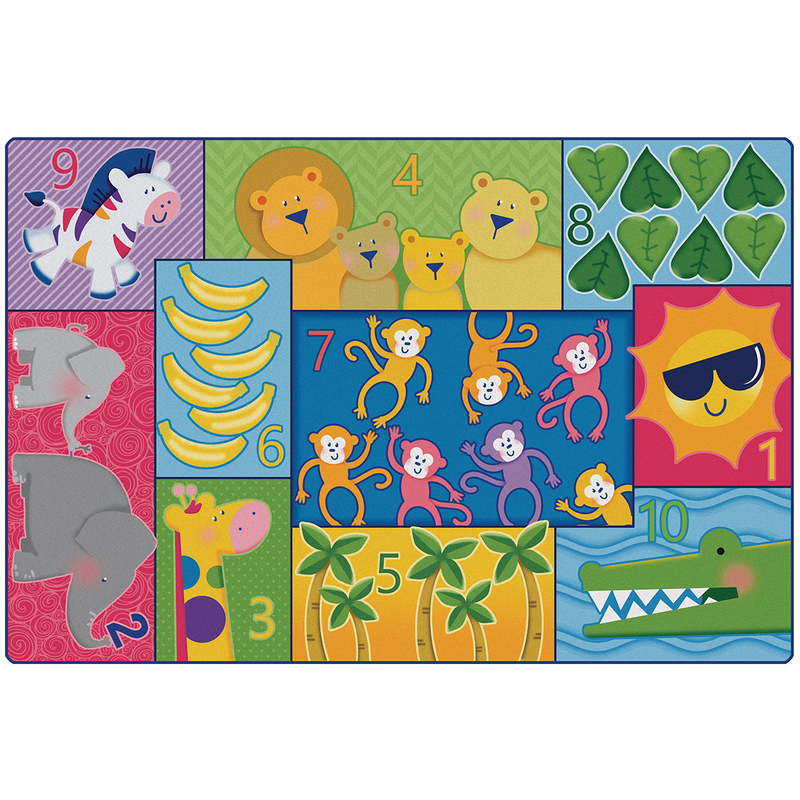 Learning gets wild on the adorable Carpets for Kids Jungle Jam Counting Rug. This school rug features numbers and loveable animals on a colorful background. The rug is made of nylon fiber that is soft but durable enough to stand up to daily wear and tear. Built-in antimicrobial treatment and Carpet Guard stain protection will keep common germs and spills at bay. KIDply backing prevents wrinkling and slipping. Made in the USA. The Carpets for Kids Jungle Jam Counting Rug comes backed by a limited lifetime warranty. Looking for new classroom rugs? Learning gets wild on the adorable Carpets for Kids Jungle Jam Counting Rug. This school rug features numbers and loveable animals on a colorful background. The rug is made of nylon fiber that is soft but durable enough to stand up to daily wear and tear. Built-in antimicrobial treatment and Carpet Guard stain protection will keep common germs and spills at bay. KIDply backing prevents wrinkling and slipping. Made in the USA. The Carpets for Kids Jungle Jam Counting Rug comes backed by a limited lifetime warranty. Choose from several sizes and order your rugs online or over the phone. Call (877) 839-3330 for assistance.